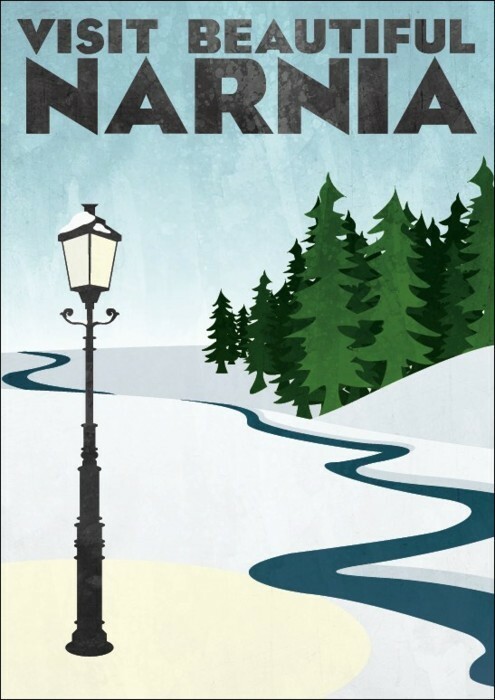 For me, the images of Narnia that are always the most magical have nothing to do with Aslan, or centaurs, or dryads, or fauns. No, for me, the images of Narnia that are the most magical are the images of a winter wonderland. Even though the winter is a result of the White Witch's spell and supposedly a bad thing, for me, this winter is forever connected with a place where everything is new and filled with seemingly unlimited potential. But perhaps my favorite example of this comes from Neil Gaiman, who got a Victorian-style lamp post for Christmas last year and put it up in the woods behind his house. You can read about it here, and see some of the pictures that Gaiman has taken with it, his dogs, and some of his creative friends. It's interesting to me that so many Narnia-related things have to do with this winter-wonderland atmosphere, which makes me think that others feel this way, too. There is something inherently magical about winter, even winter that is "always winter but never Christmas," that makes it one of the most enduring memories from The Chronicles of Narnia, and perhaps, of childhood in general.